There are over 52 thousand species of tree known to man. These are divided into softwood conifers, used to make paper, chipboard and the like, and the deciduous hardwoods. It is from the hardwoods that decorative veneers are cut. The trees are felled and the trunks are moved to either the local port, or directly to the mills. There is much discussion of the felling of the rainforests - which are composed of the deciduous hardwoods. Of the vast areas of forest being felled, much is burnt on site; these matters are very hard to quantify, but it is thought that less than 5% of all trees felled in the world are involved in wood production (paper, timber and veneer), the rest, 95%, is burnt where it lies. At the time of printing, the question of cropping trees from renewable sources is starting to be addressed. We hope that as time goes on more and more veneers will become available from these renewable ‘timber farms’. At present the varieties available from renewable tropical sources are teak, ‘greenheart’, and Indian Rosewood. We have received information that some mahoganies are now being cropped in countries such as Ghana. Temperate hardwoods - walnut, sycamore, oaks, ash, birch, yew and beech are all being cropped from plantations. Veneer production has moved away from the old centres such as London and Paris towards the producer nations in Africa and South America, and the Far East. There are some mills left in the U.K. but numbers have markedly fallen over the last twenty years as it has become more economic to slice timber near to where it grows rather than shipping logs around the world. For normal panel veneers, the trunk of the tree from the root bowl to the first limb is used. The point where the limbs branch out can be used to produce curls, and the root bowl to produce burrs; these burrs are cut from the junction of trunk and root bowl. Veneer was produced, until the 19th century, by sawing, at first by hand, and then as the Industrial Revolution gained pace, with large circular saws powered by water and later by steam. 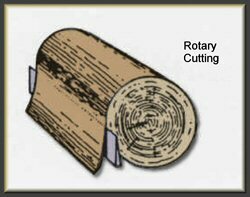 The greatest disadvantage of cutting by saw is the tremendous amount of wood lost as sawdust - to produce a leaf of veneer meant losing 4 or 5 times more in dust. This method was superseded by knife cutting, but saw cutting is still used to this day to cut very hard woods such as Gabon ebony. Prior to slicing, the logs are debarked and checked for any foreign bodies; a piece of metal that the tree has grown around would wreck the slicing knife. The whole log is then soaked in water to soften the wood; soaking can be either hot or cold depending on the specie being cut. 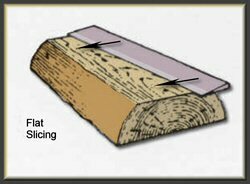 The majority of decorative veneers are cut from the log flat or half rounded. Each log is assessed so that when the veneer is cut the best yield is obtained from the wood, and the veneer cut has the figure and character which will gain the best market price. 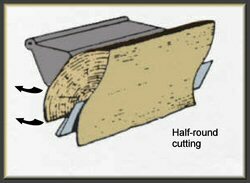 Flat Cutting has the knife moving to and fro along a flat line and the log is fed incrementally up to the knife, a veneer thickness for each cut. Burrs are usually flat sliced. Half round slicing has the log mounted off centre on a lathe. Each time the log passes the knife, a leaf is sliced off. The advantage of this method is that it will yield wider leaves from a given log than it will fault cutting. As pictures can speak a thousand words, please see the explanatory diagrams. 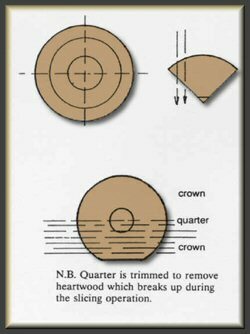 True quarter cut has the log cut into quarters and then sliced. These days, one typical fate of a log would be after soaking, that it would be ‘flat sliced’ until the heartwood is reached, giving crown cut veneer. Slicing through the centre of the log produced ‘quarter cut veneer’ on either side with the heartwood being trimmed away later. The remainder of the log is sliced as crown cut veneer. Quarter Cut Veneers: Mostly the striped species, these are available in architectural panelling lengths of up to 7 - 8 feet in length, and in actual flitch widths ranging from 6 inches up to 9 inches according to specie, with 8 inches being a fair average width. Pencil striped Sapele, African Walnut and Afromosia are examples. Curl Veneers: Vary from 18 inches to 36 inches in length (that is 46 cms x 92 cms approx) and from 12 inches to 18 inches width (30 cms x 46 cms) with a fair average being 24 inches x 12 inches (61 cms x 30 cms). Most leaves of curl are tapered. Burr Veneers: These are small, irregular shaped leaves varying from a few inches (6 inches x 4 inches) in size (that is approx 15 cms x 10 cms) up to 2 ft. or even 3ft. long by 12 - 18 inches wide (approx 61 cms or even 91 cms long by 30 cms - 46 cms wide). Fair average dimensions are 18 inches x 10 inches (approx 46 cms x 25. 5 cms). Stumpwood or Fancy Butts: These are the fancy figured short ends, size 20 inches x 15 inches - down to 12 inches x 9 inches, fair average about 18 inches x 10 inches. (in metric approx 51 cms x 38 cms - down to 30 cms x 23 cms, fair average about 46 cms x 25. 5 cms).